Carol, Will and Eric are on the run from the vampire coven in Maine that was responsible for the death of Carol’s aunt, as well as a lot of other violence in Redeemed by Jason K. Macomson, the follow up story to Refuge. Driving south in a blizzard may help separate the trio from any vampires trying to follow them, but Carol’s insistence on returning to her home in Sharon and visiting her best friend Kathy brings them more attention than they should have. Darius, the second in command to the vampire master Demetrius, tracks Carol, Will and Eric to Carol’s apartment with the help of a news broadcast describing Carol’s surprising return from the dead – she had been listed as killed in the fire in which her aunt died. Now the police are involved as well and that only helps Darius since he contacted the local coven near the town of Sharon to enlist the aid of vampire officers. Escape seems all but impossible and the question is whether Eric can save his two friends by turning himself over to Darius. Never trust a vampire, though, especially not an angry one! Redeemed is a great vampire story but an even better witness to the power of prayer and turning your life over to Christ. The three friends have a very real struggle, but with the protection of the Lord the vampires are limited in their actions against them. The problem is that Carol has not decided yet whether or not to declare Christ as her savior so she is in constant danger. The Christian message is strong but not preachy and is supported with scripture passages. 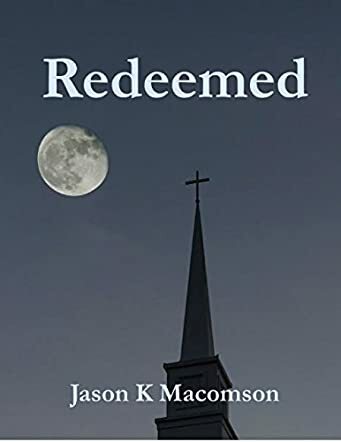 An amazing combination – Christian outreach and vampires – Redeemed by Jason K. Macomson is an exciting story well worth reading, whether you believe or not.